White Pocket Tour Guests say it is as if they have entered a fantasy landscape on an alien planet. That’s just how striking the natural rock features are to behold. Our guides will show you some of the best angles for photography. 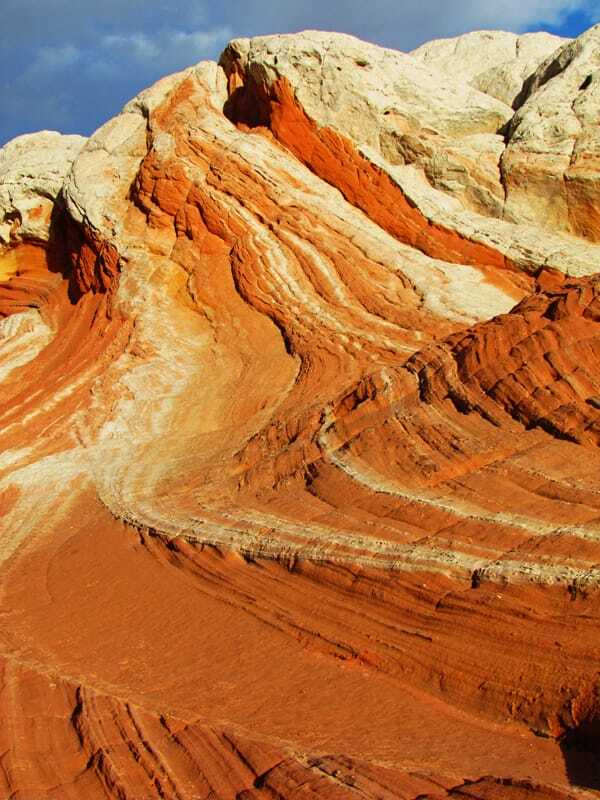 Our White Pocket Tour in extreme Northern Arizona guides you through a gnarled expanse laid bare right at the transition between the white and reddish orange sandstone. It has twists, multi-color striations of white, yellow, red, orange, and pink, pock marks and pools that sometimes fill with water, mushroom like protrusions, strange bulges that look like brains, polygonal fracturing, and wave-like features. The processes that have given yield to these bizarre rock formations stump even expert geologists. Some think that the area was liquefied in an ancient earthquake which distorted the sandstone layers while they were still soft, before they were buried under the oceans for 100 million years and turned to stone under the enormous heat and pressure. The White Pocket Tour guides you to one of the most photogenic places in the Vermillion Cliffs N.M., Northern Arizona, and perhaps the entire Southwest, rivaling the Wave in size, variety, and complexity. To find out more about how White Pocket compares to the Wave click ahead to read our BLOG. Unique compositions are literally found every few steps in this world-class photographic wonderland. You won’t want to leave. Unlike the Wave or S. Coyote Buttes, White Pocket does not require any advance permits. 9 hrs. Adults $175, Children 15 or under $87.50. Uneven footing, and small elevation changes make this terrain slightly difficult. The distance is short and at your discretion 1-2 miles.